The resulting 28 talisman images convey the power and strength of the original descriptions given in the Picatrix ! 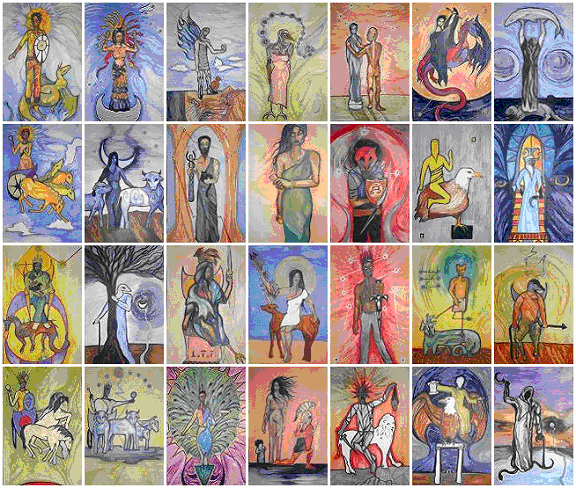 Shown below are the 28 talisman images that are included in the Talisman Images of the Picatrix option of Sirius. The images are shown in a small size, but are provided as high resolution images when purchased. These images were created by artist and astrologer Tara Cochrane based on the descriptions given in the Picatrix. As explained below the Picatrix is an ancient book which describes 4 different images for each of the 7 traditional planets. Note that we refer to the Sun and Moon as planets, but obviously they are not planets. Each column of pictures shown below is the image of a different planet; the first column is the Sun, followed by the Moon, Mercury, Venus, Mars, Jupiter, and Saturn. Each of the 4 rows of images is the 4 different images in described in the Picatrix for a planet. The Picatrix is a book that had tremendous impact on astrologers in the late Middle Ages and Renaissance. Written around the 10th century and translated into several languages, it was read by Henry Cornelius Agrippa, Pico de Mirandola, and Marcilio Ficino. The Picatrix is a classic work of astrology and astrological magic. The Picatrix provides rules for picking times when a particular planet is emphasized, such as when a sign ruled by that planet is rising and that planet is the planetary hour. The Picatrix also describes talismans (images with magical power) that can be worn or placed in a proper place at the time when the planet is emphasized. The Picatrix describes 4 different images for each of the 7 planets for a total of 28 images. Sirius provides the ability to produce an electional forecast graph that shows when a planet is emphasized using these ancient rules. UNDERSTANDING THE TALISMAN IMAGES: To help you better understand how to use the images some additional information on the talisman images and a discussion of astrological magic from a modern perspective is included. HOW TO USE THE IMAGES: you print a talisman image and at the appropriate time indicated by the electional astrology graph for this planet, you observe a ritual to dedicate yourself to a purpose that is aligned with the astrological forces at this time. Astrological magic from a modern perspective can be viewed as a kind of prayer or affirmation that is conducted with appropriate timing and imagery to strengthen the power of the prayer or affirmation, and to align your energies with natural law and a divine order. Note that this is a very modern view of how the talisman images can be used, whereas the information provided in the Picatrix. We are providing this information because it help you understand how astrologers use the Picatrix images within the context of our modern lives and ways of thinking and understanding. Of course there are many different philosophical views, and students of ancient traditions often adopt a less contemporary attitude towards their studies and practices. Shown below is a graph produced by Sirius for one day of the strength of the astrological influence of the Sun throughout the day. The graph is based on the ancient rules for determining planetary strength as described in the Picatrix and other works. The times are adjusted to the clock time for the location that you select so you do not need to convert the times. Because the rising sign and Moon sign are used in the calculations, calculations must be done for a maximum of one day at a time. 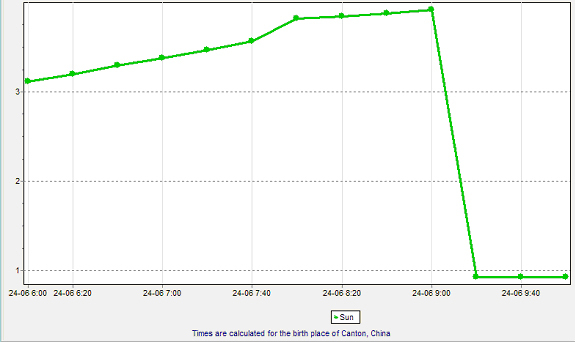 You can see on this graph a time of 8:20 AM on June 24 where the Sun strength is near its maximum. You can also re-display the graph for a shorter time period of, for example, 6 AM to 10 AM to see more clearly the times when the strength of the Sun is greatest. This graph is shown below. This graph shows that the Sun’s astrological strength is high from 6 AM to 9 AM and reaches a peak around 9 AM and then drops suddenly. Shown below is the text listing of astrological details. 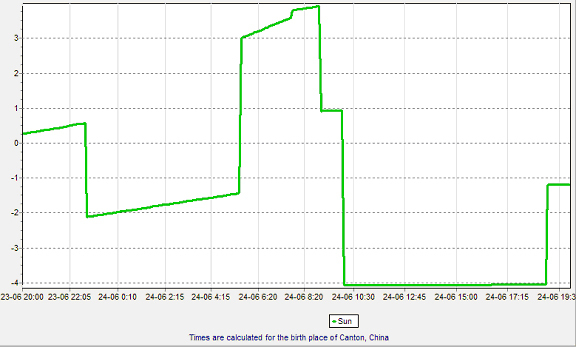 We can see that at 1:00 GMT, which is 9 AM in Canton, China which the place selected, the Ascendant is Leo (ruled by the Sun), Sun is very closely trine the Moon (1 minute orb) and the Sun is also sextile Saturn. There are also negative points assigned for the dignity of the Sun. The Sun trine Moon aspect, with Sun ruling the Asc offset the negative effect of the diginity to result in a positive score of 2.92 points. 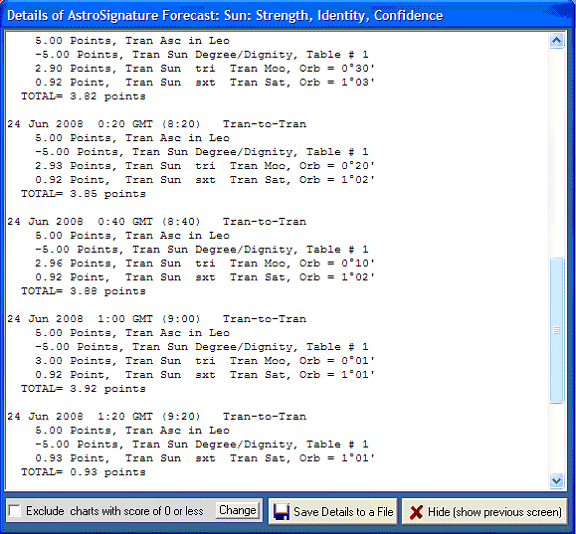 Note that these graphing and calculation features are provided with Sirius. Only the talisman images, and some explanatory information about the images are provided with the Talisman Images of the Picatrix option. When the talisman images are installed, they are easily accessible while viewing the electional astrology graph based on the classical rules for planetary strength.